Tablo Quad vs Tablo 4-tuner? So other than the ability to install your hard drive into the Quad, what other differences would there be between these two models? Do they provide the same interface? And more importantly, when will it be available? Same interface. Out in April 2019. New Tablo QUAD has a better amplified 1x4 splitter / tuner in it. Huh, so given this, would seem best to hold off on purchasing until April. Not a very good marketing approach. So other than having the ability to record up to 4 shows with the quad/4 tuner, is there a limit to how many devices can play back different recordings simultaneously? And if I had 4 recordings going on, does this mean that I can’t watch recordings? You could theoretically watch 6 different recorded shows on 6 different devices [assuming none of them are being viewed via Tablo Connect in a scenario that would require using a tuner to transcode them (remote quality set to anything but Full) reducing the number of tuners available to record from 4 to 3] while recording 4 live shows at the same time. Having said that, I’ve never actually tried that scenario to see if there is any noticeable performance impact. Great thanks… I think I’m just a bit gun shy since my current Frontier box has odd limits that, for example, force me to switch to one of the two (limit) currently recording shows if I want to watch a 3rd channel. For the price I’m paying this is ridiculous. One last thing. Not helpful to have a product not yet available as your leading ad banner product. It’s misleading. will our tablo 4 tuner get the commercial skip feature in an upgrade ?
" AND a new feature (coming soon) that will automatically skip commercials within recordings on all Tablo DVRs"
For those wanting to see a hands-on review of the new Tablo Quad see this YouTube video (from Cord Cutters News). 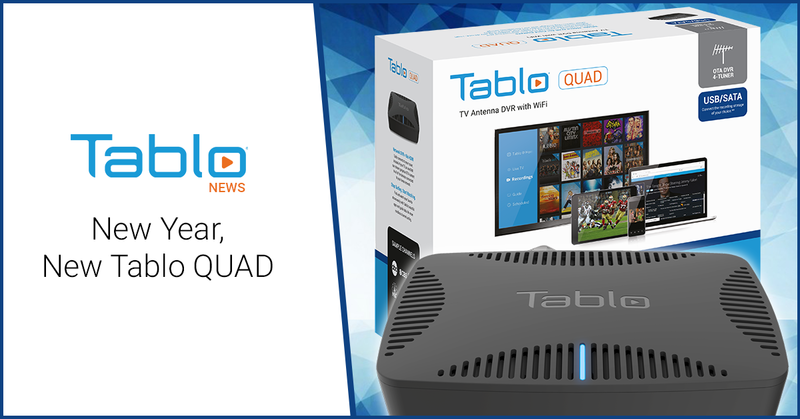 Interesting video for me, but I haven’t purchased the Quad yet and that will be my first Tablo. No mention made of the improved connectivity which actually interests me more than watching someone use an app that is pretty much available on all of the Tablos (correct?). Gigabit ethernet on the Quad if I remember right and improved wifi? My house is wired ethernet. Patch panel in the basement and a 24 port gigabit switch so I just patch in whatever port I want live. My goal will be to have the Tablo on ethernet as well as the living room Roku Ultra (arriving tomorrow). Then I’ll move the current streaming stick+ to the bedroom TV (about 30 feet from the router) and try it on 5GHz wifi. I have 4 TVs total. 3 of them will be on antenna so we can watch live TV directly on the TV if we want. The guest room TV will get another streaming stick+ as will the Kitchen TV. Nice video though. Very helpful in terms of seeing what this is going to look like and how it works. Yeah, AFAIK same software interface regardless of Tablo model. Wired ethernet will give you the most stability, but many folks have great success with wireless too - it’s just that with wireless there’s always the chance of interference from other sources/neighbors/etc. HI I also don’t understand the differences between the newest Quad and 4-Tuner. What i find surprising is that Tablo is PUSHING CUSTOMERS to buy the older 4-Tuner unit. They stress that any update the Quad would get, the 4-Tuner would get too, therefore, why wait for the Quad? They are also offering a full year of the program guide if you buy the older 4-Tuner so again, why wait for the quad? And lastly, when you look at the SPECS or when you “Compare” the Quad vs the 4-Tuner… they are the same. It’s like pulling hair to find out why one would want to wait for the new new Quad. YOU ALSO CANNOT PRE-ORDER THE QUAD!?! WHY?? I would buy one today! So i’m with others… that must be some big selling points as to why one would want to buy the Quad vs the 4-Tuner. Better Amplification of TV Channels, therefore… some channels will come in a bit stronger and/or there may be a few more channels on the Quad vs. 4-Tuner. I"m stretching now… is that really all? Faster processor? Better performance when streaming over a home network? Are there any other actual “Feature” between the 2? Something to WOW a customer into wanting to buy the Quad, with the idea that the Quad would be the latest and greatest of all the Tablo products? Again, i just am having a hard time understanding why Tablo is pushing to sell the older unit by giving the selling point that it will get updates just like the newest Quad will and again, offering customers a year of program guide for free if you buy the old unit. Is it maybe because they have 10,000 units sitting in inventory and they are afraid they won’t be able to sell them? OR they will have to deep discount them once the Quad comes out? I can’t figure it out otherwise. If Tablo’s concern that people may not want to wait for the Quad to be publicly released, therefore they want to talk people into buy the 4-Tuner, why not offer PRE-ORDER OPTIONS? I know full well i want to try a Tablo… and i would gladly do a PRE-ORDER. Anyhow, I’m looking to cut Directv. I just bought a Tivo unit off of Craigs list and it works great however, i can’t see it on Roku and therefore, i can’t see it on any other TV’s. And i WILL NOT drop another $300 to buy the blasted mini receivers so that i can watch any show on any TV. Now that i’ve ruled out that i am not a fan of the TIVO set up… i’m absolutely convinced that Tablo will have the greatest product and experience… I have a ROKU on every TV. I have for years and that was a WOOHOOO type item… meaning i have Roku 4’s on them all. I’m totally set for Tablo. I also use Plex and Play-On and between them i think the Tablo integrates into the Plex?? IF not, no biggie because i know there is the ROKU app and again, i’m set there. I really want to be able to watch my recorded programs on any TV and not worry about extra hardware. My only “wonder” at this point is, in the living room i have a Denon receiver. I’m thinking i will need to connect the Tablo to that receiver so what we can listen to the audio in 5.1 surround, and then stream to the other TV’s across the network via Roku. No other TV has a stereo receiver, lol, so we are set there. Anyhow… i’m jumping all over. Sorry. I’m a total newbie on this. I’ve been with DTV for just about 20 years and it’s all i know at the moment. I just wish Tablo would do a better job selling the Quad… so that we can all, easily see the big feature differences between the Quad and the 4-Tuner. Thanks for allowing the questions/rant/feedback request. The new Quad will also have the same tuners as the Dual Lite, which several users have stated are more sensitive and capable of tuning in a weaker signal than the original 2 or 4 tuner models. Whether or not that is true may be subjective, but they are a newer design, so hopefully they are also better. @Terster, I agree that it’s a clumsy marketing strategy, but the current 4 tuner model is a very capable product that they should continue to sell. After comparing, and really needing one now, I purchased a 4 tuner. Besides, there’s an inherent risk jumping on a newly released product. There’s undoubtedly going to be a shake out period where adjustments will need to be made to the quad. I came to the conclusion that the annouced advantages of the quad weren’t really worth waiting for in my case. Btw, the quad is larger so it can contain the external HD and makes it a bit tidier. This is a good idea, but still not enough to stall my purchase on the tablo. Thanks for your thoughts. I’m SOOOOO on the fence. I too need one. I want to dump DTV this week. I’d really like to dump Tivo too as i’m finishing my 1st month and i dont find the value in $14.95/mo for the program guide. I really believe this will be the best solution for us. I’m bummed though that i didn’t get in on the $149 lifetime for the program guide. My issue now is that if i buy the 4-Tuner, it’s a no-brainer to get the lifetime guide but then if i wind up getting the quad, then i need ANOTHER lifetime and now we are getting expensive quick. I do agree with other users that Tablo did the right thing when they wound up reversing the per user vs. per device policy and going back and grandfathering those people, but that does not help me today. I hope you post back once you receive your tuner with your thoughts. They said QUAD available for purchase end of March so I’d wait it out. Even if you cancel DTV, you can go without TV for a week or two no? Thanks again for your opinion! We’ll wait it out. My issue now is that if i buy the 4-Tuner, it’s a no-brainer to get the lifetime guide but then if i wind up getting the quad, then i need ANOTHER lifetime and now we are getting expensive quick. Only if you want subscription service on both.